So i recently (just the last weekend) had a 2+ hour session of Love Letter and really enjoyed it. I had played it before but this must have been the most fun i've ever had with it. I checked out Lost Legacy her eon the geek (not played it yet) and was surprised to find it already has a whole load of expansions (4?). I love the way Seiji Kanai has created a system of incredibly simple mechanics that can easily be modified and recombined in many different ways. It mostly doesn't really feel like anything terribly new but it's so simple and elegant and works incredibly well. (By not feeling very new i mean that some of the games of love letter almost felt like playing a 5-minute version of magic the gathering, "draw a card, make somebody discard, kill another player etc..."). The simplicity of the mechanics open up a couple of questions for me regarding thing that have been discussed here recently, namely "creation of derivative works". How close to a game like love letter or lost legacy could you design a game without it being a rip off? I mean, the basic mechanics boil down to "each player has a card, draws a card, plays a card, resolves the effect, whoever is the last player in the game or has the highest card at the end of the game is the winner". I'm wanting to do a retheme with my own art for personal usage only (making it publicly available would seem wrong, though some people seemt o have done that) but what possibilities are there for creating "fan expansions" and making those available as free PnPs? So what's your take on Love Letter and Lost Legacy? Genius? Any design space left to explore? Ideas for a retheme or expansion? So here is a qucik moch up of the basic Lost Legacy game using my own illustrations. The "story" (or simply theme?) would involve a treasure hidden in a castle. The Princess is most likely to know where it is but thieves, spies and assassins are trying to find it too. I'll have to look at LL more closely and see what tweaks can be made to further distinguish your game as it's own. 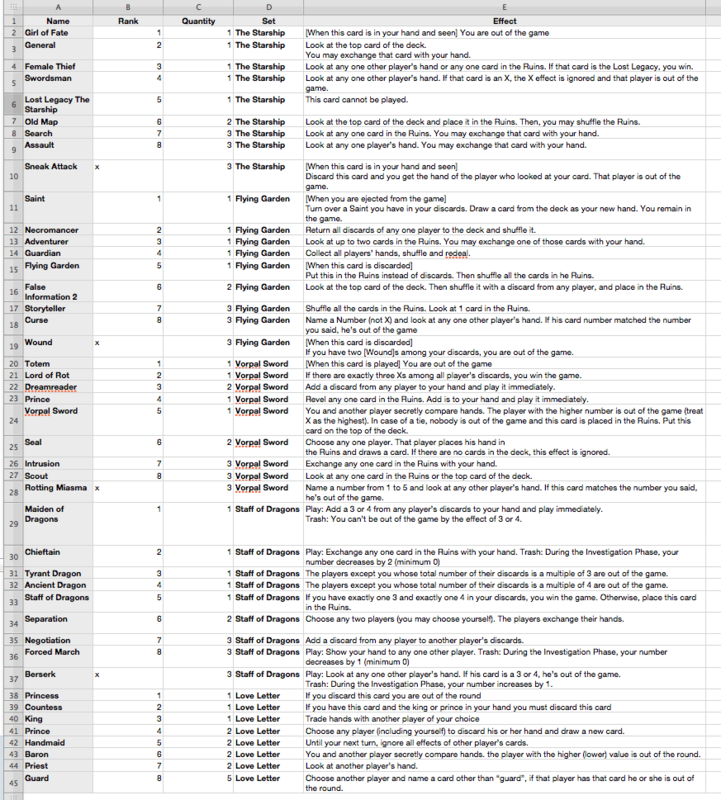 I've made a list of all the different effects of cards in Love Letter and Lost Legacy. I think i'll have to check again to see if it's really right (compiled from different files i found online). Some cards seem to have strictly better effects at the same rank. I.e. "search" (starship) has: "Look at any one card in the Ruins. You may exchange that card with your hand." whereas "intrusion" from vorpal sword gives you only "Exchange any one card in the Ruins with your hand." (no "may" condition). I'd love to hear from the designer what the design process was like coming up with the effects, which other ideas he had and whcih didn't make it into the game. To me the killer mechanic to steal from Love Letter is the binary choice. This type of two option decision is fairly common in push your luck type games but not so common in special powers type card games. Two options, if done well, is really great because the cognitive load is so low. It makes the game more welcoming to new players and yet there's no reason in principle why a binary choice - if it's truly difficult to assess which option is better - can't be super deep as well. Love Letter often fails to achieve this latter goal, however, as there are numerous cases where it's obvious which card you should play - such as if you have a Baron and a Guard together. I think the way to improve Love Letter is to make the choice of what card to play more ambiguous, more of the time, and then you would truly have something amazing. Haven't played Lost Legacy. Maybe it does a better job of this. I have collected the 3 retail sets of Lost Legacy released in Japan, and I've played them several times. (You can read some reactions to my plays of it in my BGG blog). To be clear, there have been 3 boxed releases in Japan, with each box containing two separate 16-card decks, so there are a total of 6 separate Lost Legacy decks. I don't think there is necessarily a "base" set - they are all independent decks, but they may be mixed. Some are harder to play with than others. First of all, I enjoy Lost Legacy more than Love Letter. It works with the same basic framework of Love Letter, but it adds a few new layers of deduction and manipulation of cards - enough so that you can now have a satisfying game with only 2 players, but it's still as light as you expect Love Letter to be. To be more specific about the difference, I think Lost Legacy gives you more options, and more nuance. In Love Letter, someone is either going to win or lose only by holding the #8 card. If you hold on to it, you win - but it is also makes you the most susceptible to being eliminated. In Lost Legacy, you don't need to have the Legacy card in your hand to win the game, you just need to have kept track of its location throughout the game - and then reveal it at the end. The game gives you tools to track it, push it around, hide it, and trick others about its location. Doing this while trying to put yourself in a good position to reveal it first is what adds a lot more intrigue to the game. No longer will you win simply by what card ended up in your hand at the end. You need to keep the detective work going until the end, and that's more fun. I think the biggest achievement for Lost Legacy is the variety and personality each deck offers. Each deck is structured exactly the same (16 cards, same distribution of each card) - but each deck is designed around a theme which introduces a unique new mechanic/gimmick to the game, and that gives the deck its own feel. In many cases, the one-shot mechanics of each deck work to subvert an expectation you might have about the basic Love Letter rules. Some decks may focus more on manipulating the central face-down Ruins pile, putting cards into it, looking at cards there, shuffling it...and so that deck will not offer much in terms of attacking other players. However, some decks will go the other way, and focus entirely on attacks and take-that, while the Ruins goes ignored. One deck in the second box has these two Dragon cards - one of them eliminates you based on whether the total of your played cards sums up to an even number, the other for an odd sum...so it makes you very careful as you play your cards, and watchful of others- and that deck also offers some new mechanics to steal or place cards from the discard (in order to manipulate their sum). Another deck in the most recent set makes you play cards face-down (without effect). So if a player plays a "6", the very next player must play something higher, or it must go face down. This is also new and invented for this deck. It allows players to block you from playing certain powers, but the blocked player may take that opportunity to bluff and hide the Lost Legacy face-down. There's even a card in that set which allows you to ask the table if they've seen the 1 or the 5 - and the player with the 1 may lie! The future of the game seems pretty exciting. Not only does the game welcome you to mix up cards to create your own unique deck (deck-building Love Letter?! ), but there is a lot of potential for more decks with interesting spins on the core. As a light and easy game, I could see many crazy, creative ideas and subversions being implemented. I think the overwhelming evidence is that this game lives to be modified and tinkered with, but it's important to understand how the decks are designed to be "individuals", and also able to be mixed and interact with other decks. It would be very cool if the customizing community on BGG (and elsewhere) got involved with making mechanical remixes of Lost Legacy, rather than just re-themes like Love Letter. Thanks for that informative response! first question: you say there are 3 sets of 2 16deck cards that have been released so far? But i think i'm actually missing 3 in the list of 4 i created (Castle of Conspiracy & Poor Detective and "whitegold spire"? am i missing another one?). I think what you wrote about how Lost Legacy adds alot of depth to Love Letter is probably true. Love Letter almost seems "underdeveloped" in comparison. But maybe that also makes it the more accessible game or a good introductory game for Lost Legacy?. In the same way that Lost Legacy has been expanded on Love Letter could just as well have received mechanical makeovers, almost using exactly the same design space. I.e. the Priest who gets to look at another players card ycould also use mechanics like "shuffle another players discarded cards back into the deck" or "choose two players and have them exchange cards"
I like how the "expansions" to lost Legacy slowly start touching on new mechanics like playing cards face down, more bluffing and stuff like that. That's amazing and could probably also have been used in love letter somehow. Or maybe it would first become relevant if Love Letter used discarded/played cards more or made the center card (the one taken out of the deck at the start of the game) more important. You could pobably have a set of "ruins" card in Love Letter too and more or less translate the lost legacy rules o love letter. Another game i've been wanting to play is BraveRats (also bei Seiji Kanai). - aren't these games all essentially trick taking games? -in the case of "R"(braverats) with simultanious role selection. -i need to play Verräter and Palastgeflüster of which i have a copy of each collecting dust on my shelf. Now, i was actually surpised to suddenly think of them as trick taking games because the thought just hadn't really crossed my mind yet quite as consiously. I have been working on ideas for a trick taking game in the style of Wizard for a while and it was also the inspiration to start my own deck of cards, the The Badger Deck. 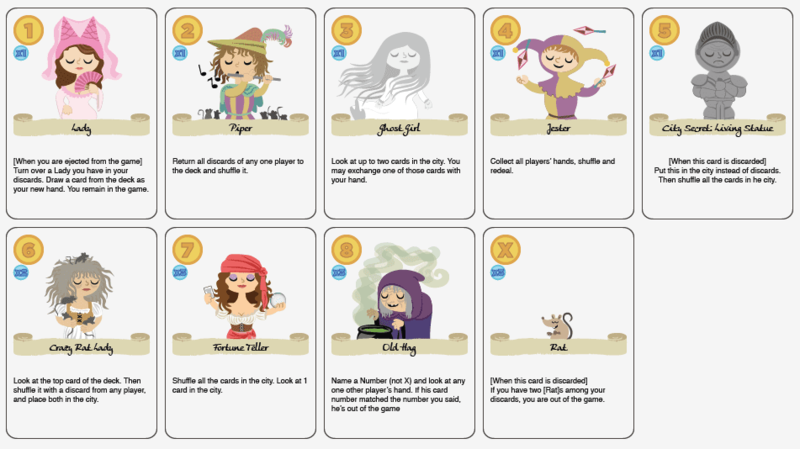 The idea was to have more cards with "special effects" like the wizard and fool in the original game (always highest and lowest cards respectively) with things like "lowest card wins the round" and loads of effects allowing players to look at other people's hands, exchange cards, discard and draw ney cards. 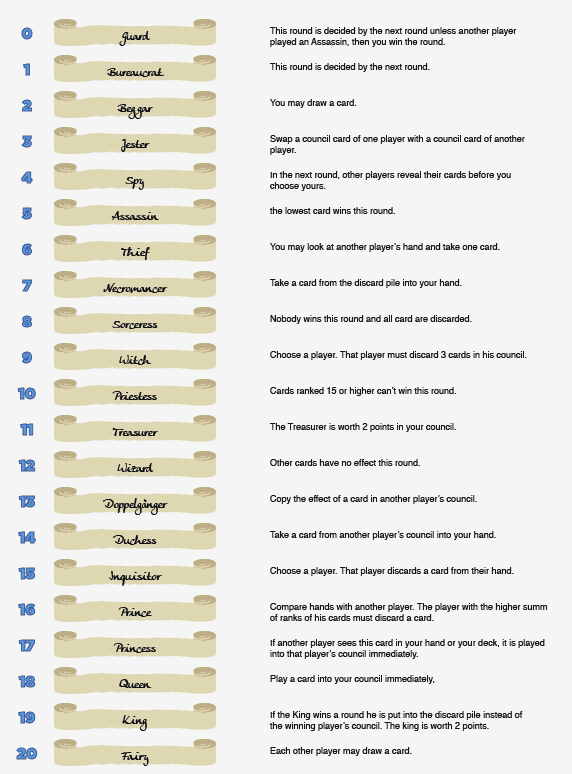 A major design choice was thinking about how many cards a player would be holding in his hand and if player's would play simultaniously (like R/braverats) or in turns (wizard/LL). So, i don't know, could LL (both LL games) be classified as a trick taking game in any way or doesn't that add any valuable information to the discussion? so in this version of Lost Legacy "flying garden", the Lady of Grevelheim is searching for the living statue in the haunted parts of the city. Looking forward to playing this tonight and hope actually playing the game will spark some original ideas for new expansions. In your list, you have the decks for set #1 and #2 from Japan. Castle of Conspiracy & Poor Detective is Set #3. 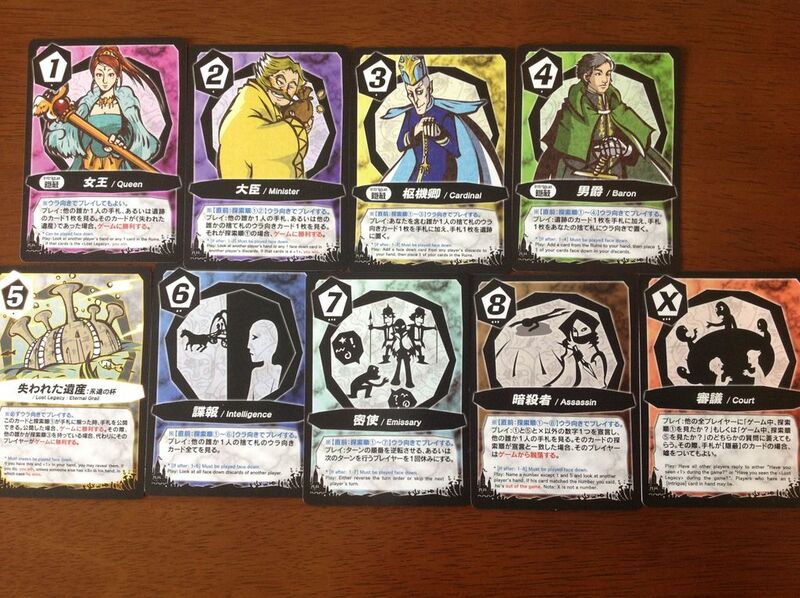 "Whitegold Spire" is, I think, a promo deck that was not given a retail release in Japan (but will be in the US). Well, I don't think Love Letter was "underdeveloped" - the goal of that game's design was probably to be very minimalistic - and it succeeded. Lost Legacy is an iteration that adds more depth, and while I do prefer it, I don't think that takes away from the achievement of Love Letter's design. Love Letter has had some tweaks, too. The original Japanese set differs from the US "Tempest version" Love Letter released by AEG - there are some slight changes to the card rules. Also, there was just recently a new release of Love Letter in Japan, with some more card changes. I don't know a lot about trick-taking games, so there isn't much I can comment on here. I see some similarities, but also many differences. The trick-taking games I know seem to emphasize imposing more limitations on what can be played (to name a few: "must play the same suit", "must play the same combination of cards", "must play something higher than the last card"). It's worth noting that Seiji Kanai designed a more typical trick-taking game, Chronicle. With that said, adding an element of a more traditional trick-taking game could be an interesting basis for a new deck mechanic in Lost Legacy. Maybe a deck could have players "follow suit" by playing only Odd or Even cards, and an X card can then switch the "suit" to odd or even...but then perhaps the Lost Legacy card can disrupt that somehow. Or maybe have all played cards move to one player after a round, based on who played the lowest card (like collecting a trick). Each player has their own deck of 10 (or some othe rumber) cards, ranked from 0-9 (or whatever ranks are possible depending on the number of cards) and each with a special effect. Players start with 3 of those card in their hand, the other cards remain in their deck. 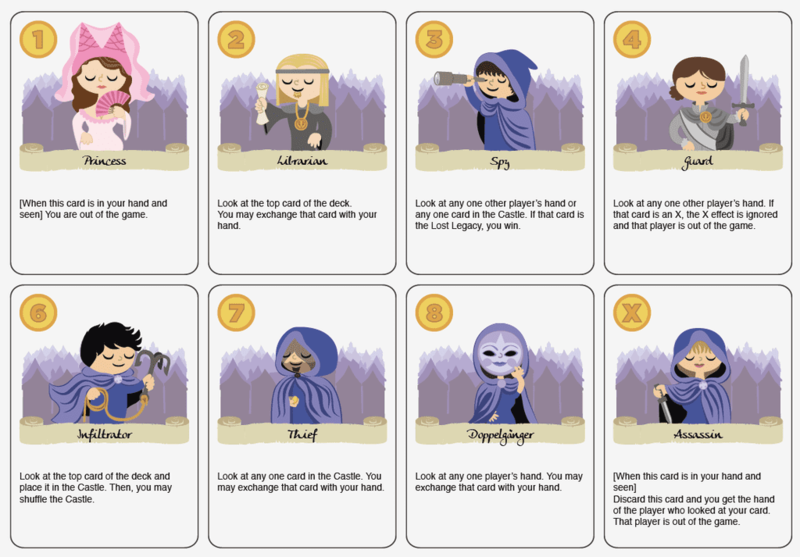 Each round players draw a card from their deck and choose a card to play. The game continues until a player has no more cards to play, then all other players discard their remaining cards and score points. Cards score different amounts of point depending on who played them. (i.e. cards with a high rank score more points if you won them off other players than if they were your own card to start with. Points are indicated on the cards, one value for "own", another for "taken frm other player"). Here is an example of what the effects could be. I've mostly stolen them from games like love Letter, R, and Chronicle. It would be interesting to see if you could actually make different decks of cards with different effects that are still balanced against each other. -single deck with 1 copy of each card. -single deck with suits, each suits has a copy of each card. I could imagine these being used for a single-deck trick taking game. Each player gets a hand of 2 cards (so he isn't elliminated immediately if he's forced to discard a card) and player take turns playing cards during a round. The player with the highest card takes the trick. 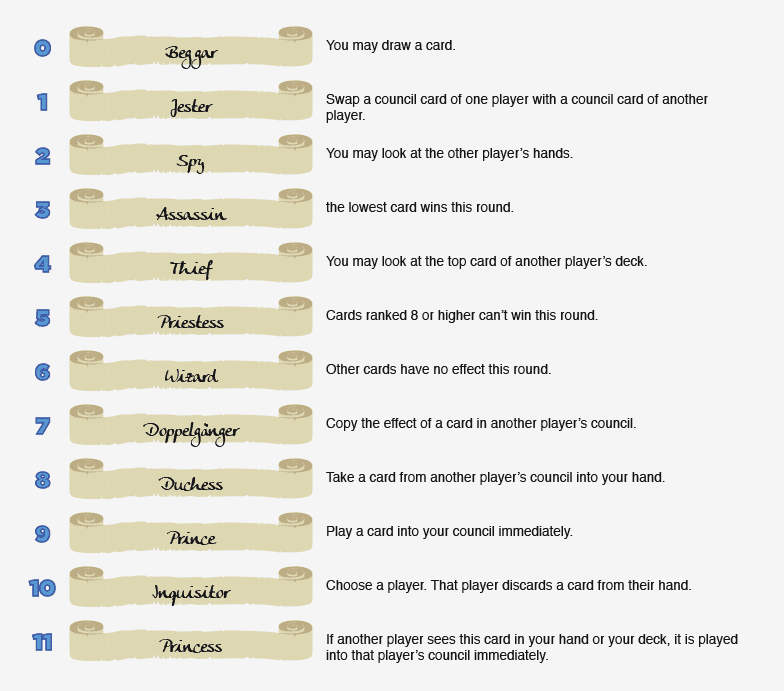 Cards taken in a trick are played in the "council" in front of a player and score points at the end of the game. Similar to other trick taking games there would probably need to be some "negative cards" that offer a risk/reward scenario where taking all of them "shoots the moon" but having only some makes loses you points. Cards could also score different amounts of points (nice way to balance cards with stronger or weaker effects). Ideally there might even be a way to have cards score differently depending on if you played the card yourself or took it from another player in the trick. That looks really good. One thing that made Love Letter (particularly the AEG version) really easy to play, was that the cards had different colour backgrounds. I'd like to see your version with the cards each having easy to distinguish colours. the point with those cards was that they're the Lost Legacy cards, not Love Letter, so the idea was to have a colour for each Lost Legacy set/expansion instead of a colour scheme for each individual card. The 1 cards are always pink, the X are always orange, and so on. It's the same in every deck. I think it helps the playability of the game, as the cards can become very recognizable just by the color. Probably easier thatway to tell them appart, and more relevant to be able to tell the numbers appart than the different expansions. It also may be hard to notice in that picture without enlarging, but the deck set is marked by an icon in the bottom-right corner (pretty standard stuff you'd expect from any customisable card game).